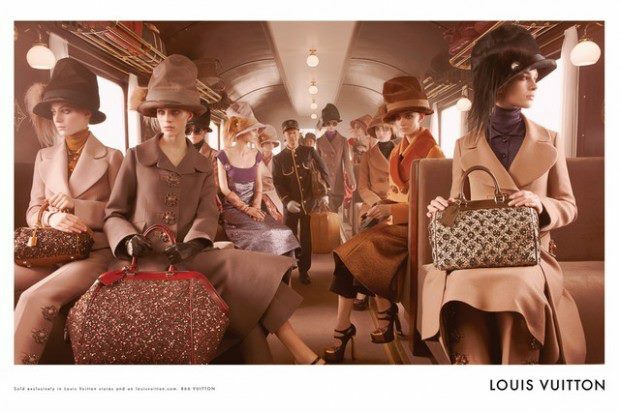 Louis Vuitton's Fall campaign comes chugging at my heart strings with its glamorous models lounging on a steam train with four porters in tow to lug their fancy LV bags around. The LV campaign reminds me of a scene perfectly set for "(My) The Great Gatsby", the novel written in Paris by F. Scott Fitzgerald, and a representation of the Jazz Age. If ever I had a time machine, I'd return to the roaring 1920s but since I don't, LV takes me there! The ads, shot by Steven Meisel in New York City, were not actually shot on the train, but at a reconstructed interior in a studio. However, the train itself is going on a glam journey. Starting on July 5, the train will be chugging its way to Shanghai for a huge show there on July 19. Models will disembark and strut around just like they did at the Paris show. The whole thing will be documented on a specially dedicated website, louisvuittonexpress.com. See some behind-the-scenes footage in which Marc Jacobs explains the look and process for the LV campaign.